Apparently, Michigan hasn't caught on to the whole local food first idea. 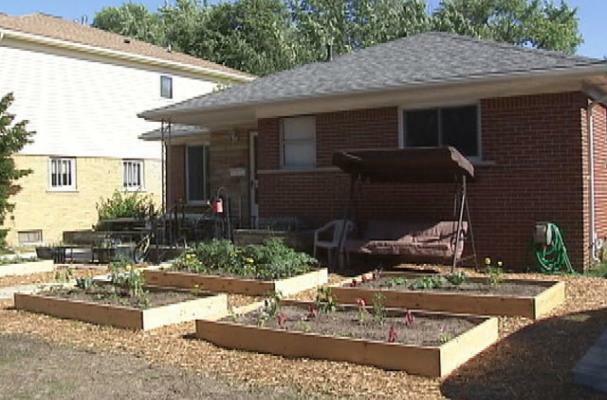 Julie Bass, an Oak Park, Mich. woman is facing 93 days in jail for planing a vegetable garden in her own front yard. "The price of organic food is kind of through the roof, so why not grow your own?" Bass said. Maybe the cops are working for Whole Foods on the side now? Actually, the front yard garden violates city code. Oak Park City Planner Kevin Rulkowski simply says "That's not what we want to see in a front yard." Bass said the neighborhood kids love to help her in the garden and that its a benefit for people to learn how to grow their own food. Take a look at the picture of the garden above. What do you think about Bass' front yard garden? Eye sore or good idea? That's ridiculous. If there were flowers on the plants they would be okay? What if squirrels eat the flowers? I'd sure rather look at that than plastic flamingos, a giant inflated Uncle Sam, etc. You have GOT to be kidding! The people in this town need to RISE UP and demand that this stupid law be removed!! I agree that there need to be statutes in place for things like junker cars and cars up on blocks and piles of garbage and old sofas with the stuffing coming out---but a LIVING garden? Come on!! What exactly constitutes what these nitwits WANT to see in a front yard? Sheesh! I think it is a fantastic idea and the town authorities need to get their collective heads out of their butts and leave her alone. In a time of soaring food prices and so many kids thinking their food comes in cans and boxes from the grocery store, I would like to see more people with front yard gardens. Thank goodness I live I a town that doesn't have such asinine rules. There are quite a number of homeowners who've ripped their lawns out and planted some great veggie gardens in their front yard. I love to drive by and see how things are growing. Great idea, but why not put it in the backyard instead? Probably gets more sunlight in the front yard. A *GARDEN* isn't what people want to see in a yard?? Wait.... let me get this straight... a suburb of DETROIT, where every other house is abandoned and dilapidated, and so many have to depend on public assistance because there is no work, is concerned about a yard that is producing FOOD??? Puh-leeze! Go find a gang to clean up instead of a good citizen's front yard. Jeeeeeeez. O M G! You have GOT to be kidding me! No offense whatsoever to the home owner, but it doesn't really look like that much of an "upscale" neighborhood that this garden in the front yard would be an issue! I would be curious to see the other front yards on the block...I'm guessing this one looks pretty good in comparison!!! I think the garden looks pretty damn good! I live in KC, KS and I think in a similar looking neighborhood. We have a community garden in a vacant lot! It's awesome! Oak Park SUX! Over the line. The officials argue that the garden does not constitute "suitable" plant life, and stick to some dictionary definition of suitable as "common". While front yard gardens are not the most common, they certainly aren't uncommon. If it is well tended I don't understand the fuss. Someone needs to mind their own business. Unbelievable! I cant understand why they have silly laws like this. Going to jail just because you grow your own food?